Author contributions: All the authors contributed to this manuscript. Institutional review board statement: Approved by the Policlinico S. Orsola Malpighi review board. Informed consent statement: Approved by the Policlinico S. Orsola Malpighi review board. Conflict-of-interest statement: The authors of this study certify that they have no affiliations with, or involvement in any organization or entity with any financial or non-financial interest, relating to the subject matter or the materials discussed in this manuscript. This study was fully supported by the Department of Anesthesiology of the University of Bologna. Data sharing statement: No data were created so no data are available. The use of Epidural Anaesthesia within a fast track protocol for cirrhotic patients undergoing liver resections had a positive impact on the patient’s outcomes and comfort as demonstrated by a significantly lower length of mechanical ventilation and hospital stay in the epidural group. The technique appears to be safely manageable in this fragile population even though these results need confirmation in larger studies. Core tip: This retrospective study evaluates the potential benefits and risks of the use of epidural anaesthesia within an enhanced recovery protocol in the subpopulation of cirrhotic patients undergoing liver resection. We included all cirrhotic patients who underwent open liver resection between January 2013 and December 2015 at our Unit. The study included 126 cirrhotic patients, 86 patients received general anaesthesia and 40 combined anaesthesia. The two groups presented homogeneous characteristics. The epidural group had a lower intraoperative mean arterial pressure (P = 0.041) and received more colloid infusions (P = 0.007). Postoperative liver and kidney function did not differ significantly. Length of mechanical ventilation (P = 0.003) and hospital stay were significantly lower (P = 0.032) in the epidural group. No complications related to the epidural catheter management were recorded. Fast track surgery or Enhanced Recovery after Surgery (ERAS®) programmes have been first described in the 1990s in the field of colo-rectal surgery. These programmes entail a number of evidence based actions aimed at reducing unnecessary perioperative stress and inflammation, and restoring as quickly as possible the normal preoperative physiology. Since their first introduction ERAS programmes are being implemented in different surgical specialties, and in more recent times also in the field of liver surgery[2-6]. A recent meta-analysis evaluating five randomizedcontrolledtrials, has consolidated the evidence indicating that ERAS applied to liver resection surgery has a positive impact on post-operative complications and length of hospital stay. The use of epidural anesthesia and analgesia is a vital part of any enhanced recovery program, mostly because it blunts the neuroendocrine response to surgical stress and allows better postoperative pain control and faster mobilization. Epidural analgesia has been widely applied in the field of open liver surgery with very positive results in terms of reduction in pain scores. However cirrhotic patients undergoing liver resection represent a special subpopulation with a high risk of developing perioperative complications. In these patients the preoperative liver function, and the future remnant liver volume, are critical factors in determining perioperative morbidity and the placement of an epidural catheter, and its management, could present potential risks, most of which related to coagulation disorders. Another aspect to be taken into consideration is hemodynamics, in fact the cirrhotic hyperdynamic circulation could be particularly influenced by the sympathetic blockade produced by an epidural block, potentially leading to splanchnic malperfusion, which could be reflected in postoperative organ dysfunction. In a previous study we evaluated the incidence of post liver resection coagulopathy in cirrhotic patients, and discussed its hypothetic impact on the management of an epidural catheter (Figure 1). Following the results of this study, we have implemented a wider use of Epidural analgesia and anaesthesia also in a selected population of cirrhotic patients undergoing Liver resections. To date there are no studies considering the application of ERAS protocols to cirrhotic patients and the importance of epidural anesthesia within these protocols. Moreover most of the studies considering ERAS protocols applied to liver surgery populations have included patients undergoing liver resections for colorectal metastasis[3,5,6,12], in whom underlying liver function is expected to be normal. Figure 1 Course of post-operative coagulopathy. The figure displays the percentage of the patients in the two study groups presenting significant alterations of coagulation exams. Platelets count < 100000/μL or INR > 1.5 post operatively at day 1, 3, 7. INR: International normalized ratio; POD: Postoperative days. The primary objective of this retrospective observational study was to evaluate the use of epidural analgesia in an ERAS program dedicated to cirrhotic patients undergoing liver resection for hepatocellular carcinoma (HCC) in terms of length of hospital stay, and incidence of complications. Secondary objectives of the study were to evaluate the differences in terms of intraoperative hemodynamic stability, fluid management and postoperative liver and kidney function tests. Following the approval of our Hospital Ethics Committee (approval number: 100/2014/O/OssN), we conducted a retrospective observational review including all cirrhotic patients who underwent open liver resection between January 2013 and December 2015. Inclusion criteria were: Age > 18 years, histologically proven liver cirrhosis, open liver resection surgery for HCC. Exclusion criteria were: Abnormal preoperative coagulation profile contraindicating an epidural catheter placement [international normalized ratio (INR) values ≥ 1.5 and/or platelet count < 100.000/μL], laparoscopic liver resection. Major hepatic resection was defined as a resection of three or more hepatic segments, whilst a minor hepatic resection was defined as a resection of two or fewer hepatic segments in accordance to the IHPBA classification. All the liver resections were performed to achieve a tumor-free margin of at least 1 cm based on intraoperative examination and ultrasonography. Patients were divided into two groups on the basis of the placement of an epidural catheter. The control group was composed by the patients who refused the placement of an epidural catheter, at the pre operative interview with the anesthetist. The same team of surgeons performed all of the surgical procedures. The ERAS protocol was applied to each patient included in this study. The main features of the ERAS protocol for cirrhotic patients used at our unit are described in Table 1. The anesthetic management for liver resection at our unit includes: General endotracheal anaesthesia, arterial line and central venous catheter placement for fluid infusions, hemodynamic monitoring (EKG, arterial blood pressure, CVP), and acid-base parameter measurement (blood gas analysis data). Table 1 Fast track protocol for cirrhotic patients undergoing liver resection. ICU: Intensive care unit; CVP: Central venous pressure; POD: Postoperative days; NRS: Numerical rating scale. General anesthesia is induced with propofol (2-2.5 mg/kg), fentanyl (1-2 mcg/kg) and rocuronium (0.6 mg/kg), while Sevoflurane 0.7-1.0 MAC and boluses of rocuronium and fentanyl are used for maintenance. For combined anesthesia a T8-T9 epidural catheter is positioned before anesthesia induction. Anesthesia is induced with propofol, fentanyl and rocuronium, at the same dosages mentioned above, the epidural anesthesia is induced with an initial bolus of L-bupivacaine 7.5-10 mg and 10 mcg sufentanil, followed by a continuous infusion at 5 to 7 mL/h of L-bupivacaine 2.5 mg/mL. Narcosis is maintained with Sevoflurane at a concentration of 0.5-0.7 MAC, adequate muscle paralysis is maintained with boluses of rocuronium. Postoperative pain control in patients without epidural is maintained with a PCA system with intravenous morphine (1-2 mg/h continuous infusion, bolus 1 mg, lockout 15 min, maximum dose in 4 h 18 mg) and boluses of paracetamol (1 g intravenous, max 3 g per day), when oral intake is possible, morphine is substituted with oxycodone. Postoperative pain control in patients without epidural is maintained with a PCA system with intravenous morphine (1-2 mg/h, bolus 1 mg, lockout 15 s, maximum dose in 4 h 18 mg) and boluses of paracetamol (1 g intravenous, max 3 g/d), when oral intake is possible, morphine is substituted with oxycodone. In patients with the epidural catheter, postoperative analgesia is maintained with a continuous epidural infusion of L-bupivacaine 1.25 mg/mL and sufentanil 0.5 mcg/mL at a rate of 5-7 mL/h. After the first 36 hour post operatively only the local anesthetic infusion was maintained and the opioid stopped. Intravenous paracetamol (1 g iv, max 3 g/d) is added if more analgesia is needed. Fluid infusions during hepatic dissection follow the units protocol and target a low central venous pressure (≤ 6 mmHg). Red blood cells in cirrhotic patients are transfused when hematocrit is lower than 24% and/or hemoglobin is lower than 8 g/dL. The occurrence of hypothermia was prevented by infusion of warm fluids, forced-air warming and the use of warm water on the surgical field. Perioperative coagulation alterations are corrected according to POC coagulation testing using a tromboelastograph (TEG®). All patients at end of surgery were admitted to the intensive care unit (ICU). The routine ICU admission for at least the first post-operative night is a part of the ERAS protocol for cirrhotic patients used at our unit (Table 1). Data collected preoperatively included patient characteristics, underlying surgical pathology, etiology of cirrhosis, MELD score, baseline coagulation profile and blood tests. Intraoperative data analyzed included type of hepatic resection, fluid infusions and transfusion of blood products, while hemodynamics and blood gas analysis data were registered at the beginning of the intervention, after resection and at the end of surgery. Postoperative blood tests collected were liver and kidney function tests on postoperative days (POD) 1, 3 and 7. Postoperative complications were also evaluated using Clavien-Dindo classification, acute kidney injury was classified following AKI network criteria. Statistical analysis was carried out with IBM SPSS 21. Categorical data were expressed as numbers (percentages), continuous variables as mean and standard deviation. Differences in perioperative data between groups were evaluated with t-test for continuous variables and χ2 test or Fisher exact test for nominal variables. A general linear model for repeated measures was used to compare postoperative function tests and intraoperative measures of arterial pressure, central venous pressure and blood gas analysis data. For Clavien-Dindo classification and postoperative kidney injury evaluated with AKIN score, Mann-Whitney test was used. From January 2013 to December 2015, 183 cirrhotic patients underwent elective open hepatic resection for hepatocellular carcinoma at the Department of Surgery and Transplantation of Bologna University. Fifty-six of these were excluded because their preoperative coagulation profile was incompatible with the placement of an epidural catheter. The remaining 126 patients were included in the study and divided into two groups on the basis of the presence of an epidural catheter during surgery; 86 patients received a general endotracheal anesthesia (group no epidural) while 40 patients received a combined anesthesia (group epidural). All of the patients who received epidural anaesthesia, could effectively control post-operative pain with the epidural protocol and did not require intravenous opioids, also no catheter displacement occurred. The two groups were homogeneous for the demographic aspects, and etiology of cirrhosis, Table 2 shows preoperative data. Intraoperative data showed a significantly lower mean arterial pressure during resection and higher hypotension time and colloids infusions in the epidural group (Table 3), whilst central venous pressure (CVP) and metabolic data in terms of pH, lactate and base excess were not significantly different. Postoperative liver and kidney function tests, as well as platelet count did not significantly differ between the two groups (Table 4). HBV: Hepatitis B virus; BMI: Body mass index; HCV: Hepatitis C virus; AST: Aspertate aminotransferase; ALT: Alanine transaminase; INR: International normalized ratio. MAP: Mean arterial pressure; RBC: Red blood count; Lac: Lactate; BE: Base excess; CVP: Central venous pressure. For repeated measures, the P value expressed under the variable is referred to the between subjects effect test. AST: Aspertate aminotransferase; ALT: Alanine transaminase; INR: International normalized ratio; POD: Postoperative days. The course of postoperative coagulopathy is shown in Graph 1, we have to highlight that on POD 7, 6 patients out of 126 still had a measurable coagulopathy (INR > 1.5 and/or Plt < 100000/μL). Amongst these patients 3 had undergone a minor resection and one a major resection under general anaesthesia. The remaining 2 patients with coagulopathy had undergone a major liver resection with a combined anesthesia and had to have their coagulations profiles corrected before a safe removal of the epidural catheter could be performed. The correction was performed with the infusion of FFP and there were no complications after the removal of the catheter. The length of ICU stay did not significantly differ between the two groups. The duration of mechanical ventilation and length of hospital stay were significantly lower in the epidural group (Table 5). Table 5 Hospital length of stay and complications. MV: Mechanical ventilation; PO: Postoperative; AKIN: Acute kidney injury network classification; DINDO: Clavien dindo classification of surgical complications. The rate of complications and their severity classified following Clavien-Dindo score and postoperative acute kidney injury did not differ, however 9 cases of post-operative delirium were recorded, all of which occurred in the general anesthesia group. In the epidural group no complications related to epidural catheter placement or removal were recorded. 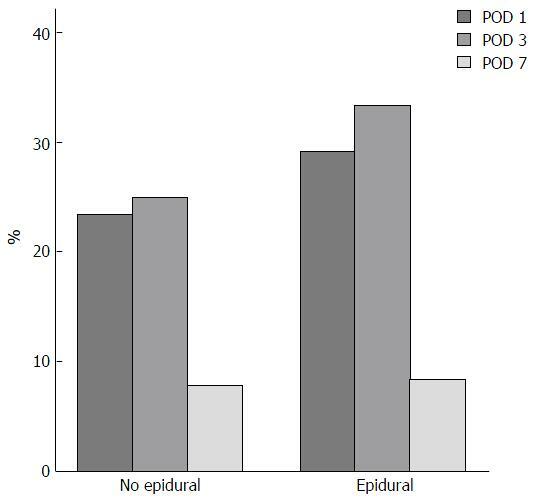 Epidural catheters were usually removed between POD 3 and 5 and there was no need for major analgesics adjuncts in these patients. The results of this study suggest that the use of epidural anaesthesia and analgesia in the context of ERAS® protocols for cirrhotic patients undergoing liver surgery is feasible. In fact none of the patients in the epidural group had complications related to the positioning or the removal of the epidural catheter. However, the incidence of an epidural complication requiring an elective surgical treatment varies between 1 event in 22189 and 1 event in 4330 epidural placements in the general population. Hence to consistently rule out the potential safety issues relating to epidural catheters in the specific subpopulation of cirrhotic patients, a larger sample should be considered. Postoperative coagulopathy is considered another great risk in cirrhotic patients, often limiting the use of regional anesthesia techniques in this subpopulation. However the incidence of the postoperative coagulopathy, especially in minor resections, appears to be compatible with the safe management of an epidural catheter. It also must be underlined that hemostasis alterations in cirrhotic patients are more complex than a simple increase in hemorrhagic risk due to coagulation factors deficiency. Hence laboratory values such as the INR and platelet count do not describe entirely the wide array of alterations, which constitute the hemorrhagic risk of these patients. Probably in the near future thromboelastometry will have a major role in better defining the individual coagulation profile. Moreover, neuraxial blocks are safely undertaken even in patients assuming platelets inhibitors such as ASA and undergoing surgical interventions in which systemic anticoagulation is prescribed in the postoperative period, such as peripheral vascular surgery. Combined anesthesia had significant intraoperative hemodynamic effects in terms of lower mean arterial pressure and longer hypotension duration, which required more colloid infusions but had no metabolic effects on base excess and lactate concentration, even CVP was not significantly affected by the sympathetic blockade. Postoperative data showed slightly higher AST and ALT values in the epidural group, however it must be noted that, in this group, major resections were more frequent than minor resections, hence these data are difficult to interpret. Finally these differences in postoperative transaminase levels did not have any clinical impact, as no cases of postoperative liver failure were observed, and the postoperative courses of INR bilirubin and kidney functions were substantially comparable between the two groups. A recent large retrospective study by Kambakamba et al postulated that epidural anesthesia could have a role in jeopardizing postoperative kidney function in major, but not in minor liver resections. The difference in our results could be explained primarily by the fact that cirrhotic patients were excluded from the analysis in the Kambakamba study; also our sample is much smaller in size and we did not register a use of vasoactive drugs to correct intraoperative hypotension as extensive as the one in their study group. Postoperative complications were not significantly different between the two groups, however it is interesting to note that in the group without epidural anesthesia we observed 9 cases of postoperative delirium, while none was observed in the group receiving epidural anesthesia. Also respiratory complications were observed only in patients treated with general anesthesia and postoperative systemic opiates. Patients receiving epidural analgesia in 50% of the cases were extubated at the end of surgery in the operating theatre, and in general required fewer hours of mechanical ventilation. These results indicate a beneficial role of epidural anesthesia with regard to the respiratory system function and its possible postoperative complications. The shorter postoperative hospital length of stay observed in the epidural group could be related to a better analgesia, faster ambulation and a better postoperative intestinal function. We registered a longer mean hospital length of stay than the one enounced in other studies; the composition of our study population considering only cirrhotic patients has contributed in altering our results in this sense. Another important aspect to underline is the large number of patients which were considered not eligible for neuraxial analgesia (57 out of 183 patients), in which other analgesic techniques to reduce postoperative opiates use, such as continuous wound infusion of local anesthetics, intercostal nerve blocks, intrathecal morphine administration and TAP block could find an indication. In a recent review by Hughes et al these techniques appear to be in some cases even superior to epidurals in terms of reduction of postoperative complications, despite providing less relief from pain. Another recent RCT from Hughes et al has compared epidural anaesthesia and analgesia with a combination of TAP and rectus sheath block with continuous wound infiltration, confirming the superiority of this alternative technique to TEA in terms of post operative complications and recovery and also achieving comparable pain scores. These results are particularly promising especially because to our knowledge this is the first trial achieving comparable pain scores with a technique alternative to TEA, and need to be confirmed by larger multicenter trials. Finally it is our belief that, based on the most solid evidence available at the moment, the use of TEA still represents the technique providing the most comfort to the patient whilst accelerating post operative recovery compared to standard general anesthesia and opiate analgesia; alternative analgesic techniques find their correct indication in those patients not eligible for an epidural catheter positioning making a complete avoidance of systemic opiates in this population achievable. The main limitations of the present study lay in its retrospective design, and the limited numerosity of the sample, which originated from a single center. In conclusion, the main results of this study show that the known benefits of thoracic epidural anaesthesia and analgesia within an ERAS protocol for perioperative management, seem to be reproducible in a subpopulation including only cirrhotic patients undergoing open liver surgery. Epidural anaesthesia plays a major role in accomplishing many of these benefits, and its systematic use has important effects on patient outcomes and comfort. Our results also show that, in a selected population of cirrhotic patients, the technique can be performed safely without complications even if this aspect needs to be confirmed in larger populations. Enhanced recovery after surgery is a solid reality in most surgical specialties and has been successfully applied to liver surgery. The subpopulation of cirrhotic patients undergoing liver resections has been poorly studied and represents a challenge for the application of such protocols. Moreover the use of epidural anaesthesia and analgesia in this subpopulation is still a matter of debate. Defining the possible benefits of using epidural anaesthesia within an Enhanced Recovery after Surgery (ERAS) protocol for cirrhotic patients undergoing liver resection surgery is of great relevance in order to further implement the use of such protocols. This is the first retrospective study showing improved post operative outcomes using an ERAS protocol and epidural anaesthesia in a population including only cirrhotic patients undergoing liver resection surgery. These data suggest that the implementation of an ERAS protocol for cirrhotic patients using epidural anaesthesia is feasible, safe and provides positive clinical outcomes. This could be of great value in spreading the implementation of ERAS protocols to this particular subpopulation of patients. The manuscript describes the findings of a retrospective review to determine if there are benefits with the use of ERAS and epidural during liver resection surgery. The study is reasonably large and could provide useful information to the readers.